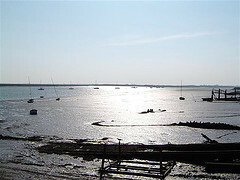 Essex is really kind of beautiful you know, especially the coast. Its crinkly bits around the edges rival the fjords for ooh-factor, although it is of course as flat as Norway is mountainous. Shame the county is so very maligned, and that it has traditionally been used as an overflow outlet for the capital: re-housed East Enders, dormitorised commuters, unwanted air traffic. News today of overflow of a different kind. Crossrail is kindly to donate its excavated earth, clay, chalk, sand and gravel to Essex. Sounds like a bit of a bum deal, but in a very imaginative partnership with the RSPB, the aggregate is actually to be used to shore up bits of Wallasea Island as part of a project to create a saltmarsh haven for sea birds and wildlife. With pleasing symmetry, just as Crossrail is the biggest single engineering project in Europe currently, so the wildlife reserve will be the biggest of its kind. We like this sort of recycling and creative engineering. It’s not new of course – much of Stamford Bridge is founded on recycled earth from the construction of the Metropolitan Line. We can dig salt and wild and wind in our face. This Essex born Londonista has spent many happy days listening to the curlews and larks on the sea-wall there, fair-weather sailing, drinking warm beer at the island’s token pub and listening to tales of smugglers. We’ll be following this project with interest..
Essex Marshes from Colsta’s flickr stream under the Creative Commons Licence.